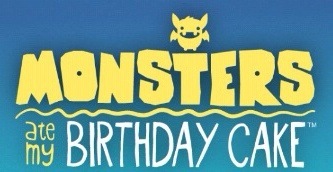 Monsters Ate My Birthday Cake (MAMBC) is an adventure-puzzle hybrid developed by SleepNinja Games and published by Cartoon Network. While you might think from the cartoony art style and the playful, cheesy dialogue (fart jokes!) that it’s an easy kids’ game, MAMBC is actually quite challenging. You start the game playing as a little boy named Niko. It’s Niko’s birthday, and he wakes up to find his birthday cake is missing! He follows the crumbs and discovers that monsters called Boogins have taken his cake! Now he must venture out to explore Gogapoe Island and retrieve all the cake pieces. It may sound like an absurd plot, and it is, but it works because the game plays on the absurdity. Also, while out looking for cake crumbs, Niko discovers there’s a lot more at stake here than his birthday cake. 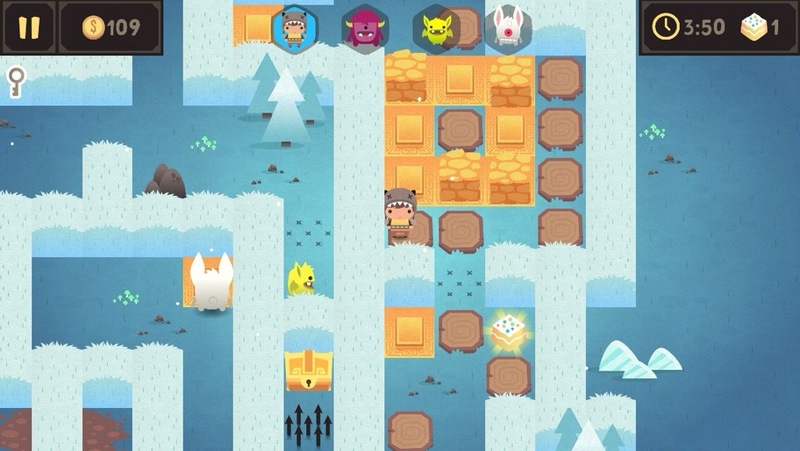 What starts off as a hunt for dessert unravels into a more serious adventure as you progress. Suddenly, Niko has a real purpose! 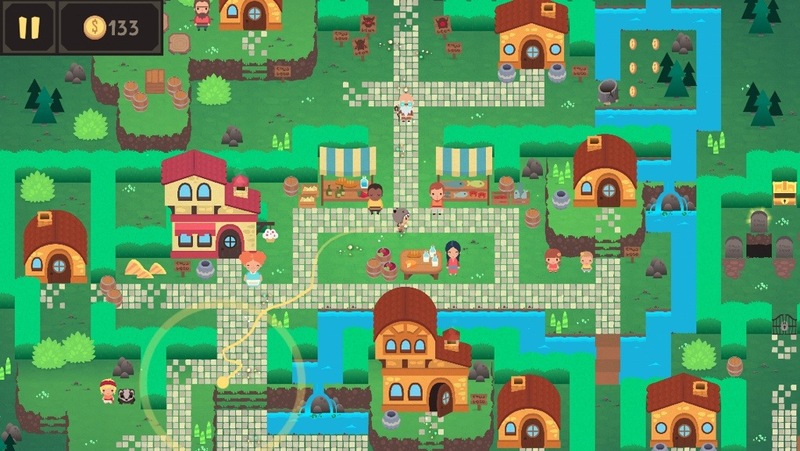 MAMBC may seem at first to be a Zelda-like game, but it’s actually more of a puzzle game. Sure, it has a town that would fit perfectly in Hyrule, where townspeople give you side-quests, and there are some sliding-block puzzles. But the similarities mostly end there. Niko doesn’t wield a sword, or any weapon for that matter. Niko’s only ability in the beginning is that he can grab onto blocks and slide them around, such as onto switches that turn spikes on and off. 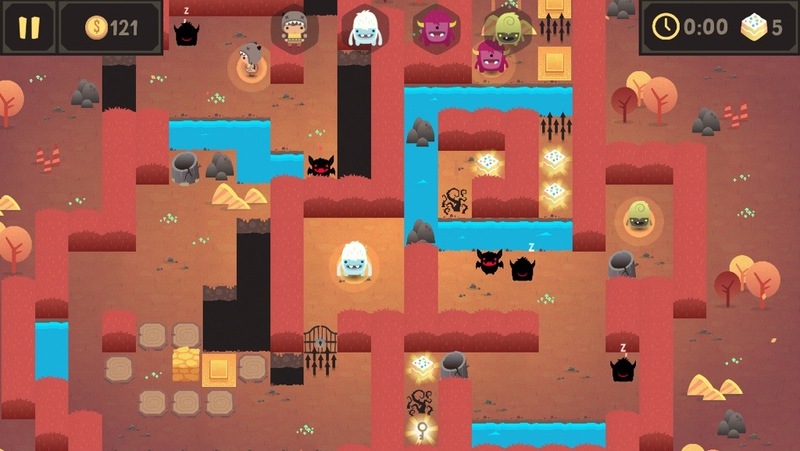 The gameplay mainly consists of four areas broken up into maze-like levels. The cake pieces are strewn about, with obstacles in Niko’s way. Obstacles can vary from spikes to crystals, various types of Boogins, water, lava, tree stumps, and so much more. You control Niko (and other playable characters) by selecting him and then drawing a path with your finger from him to where you want to go. At first, this seems awkward, but the more you play the more it makes sense. The characters follow your path exactly, so if your line zig-zags, the character will zig-zag. 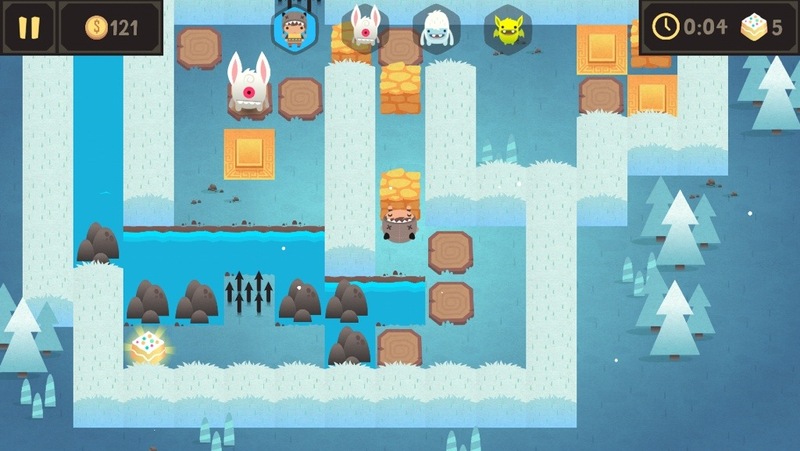 In later levels, the line you draw becomes a big part of your strategy. It’s not just about where your character is going, but how he gets there. For instance, certain Boogins sleep until you cross their path, at which point they charge. Often, you need them to charge into something to break it, or simply to fall through a hole. They move quickly, so you need to draw a line that makes your character go just into their line of sight, and then quickly out of sight. It may take some practice, but you’ll soon get the hang of it. To move a block, Niko needs to stand next to it and then double-tap the screen. This makes him grab onto it. Then you draw the line to have him push the block where you want it to go. 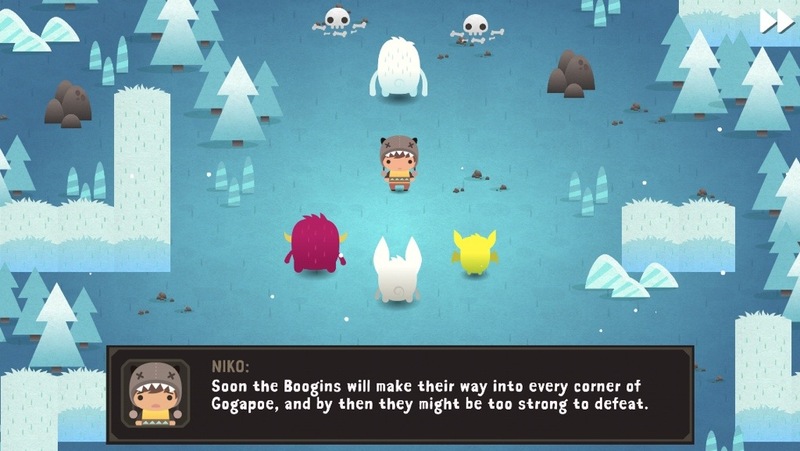 Along the way, you’ll meet friendly monsters that each have a special ability. These creatures join up with Niko to help him on his journey. As the puzzles get more intricate, you’ll need these different monsters’ abilities in order to progress. 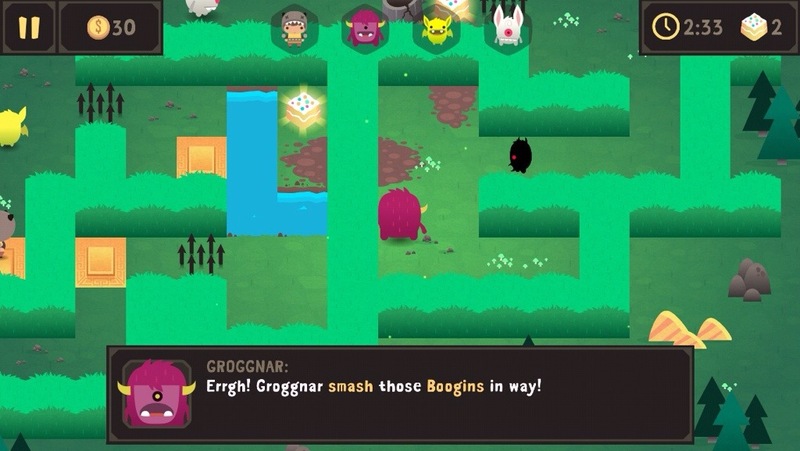 For instance, Groggnar has Berzerk-o Charge, which allows him to smash down tree stumps and kill Boogins. Eek has Sonar Shriek, which shatters crystals and stuns Boogins. Biff, a yeti-like creature, has Blizzard Breath, which freezes water and lava and turns Boogins into ice blocks. Each level has them set up in a certain way so that you need to plan out how each of their abilities will allow you to collect all the items. Their abilities work the same way as Niko’s — you double-tap the screen to activate them. The game only let’s you take in four characters at a time, so even though you collect more monsters, they aren’t all needed in one level. That’s good, because controlling four characters at a time is challenging enough. On my small iPhone 5 screen, I can’t see dealing with more than that. I have hit a few hiccups with the control scheme on my small screen. If two characters are close to each other, it can be cumbersome to try and move the one you have in mind. I’ve also made some silly mistakes like forgetting that a character was standing on ice before turning it to water (remember, you have four to keep track of at a time). This results in a “death,” which forces you to restart the level. Deaths from clunky controls or carelessness can be frustrating, but each level is small enough that it’s not too big of a deal to start over. Also, each time you replay a level, it should be easier just because you’ve had practice with it already. The only problem is that these fiddly controls could make getting the stars for the time bonus a little too hard. I imagine all this is easier on the bigger screen of an iPad, so if you have one, you may want to play on there instead. Each level has three stars you can earn by accomplishing different missions, such as collecting all the cake pieces, completing the level under a time limit, defeating all the Boogins, or even sparing all the Boogins. This adds an extra layer to the game, because you can’t just rush through a level, hoping everything will fall into place. You really have to think things through if you want to collect all the stars. Additionally, there are certain stars that can’t be collected the first time you visit the level. 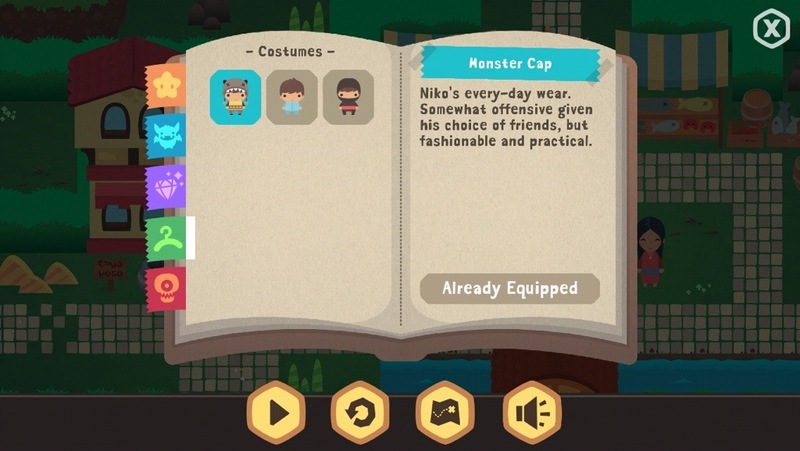 You need to come back later in the game, when you’ve unlocked a certain outfit for Niko (there are several to unlock). This is a nice touch, because it means you don’t just play through the game once and never look back. And lest I forget, MAMBC has zero in-app purchases (IAPs). You get the entire game for the price you pay up-front. This is a rarity these days, and quite refreshing. So even though there’s an in-game store with items that can be bought with gold coins, you need to earn those coins by playing the game. Coins can only be picked up once, so there’s no grinding. But this is to force you to try and collect all the coins — NOT to get you to buy them with real cash. So go ahead and leave your credit card back in the real world where it belongs. Need help finding Niko’s outfits? 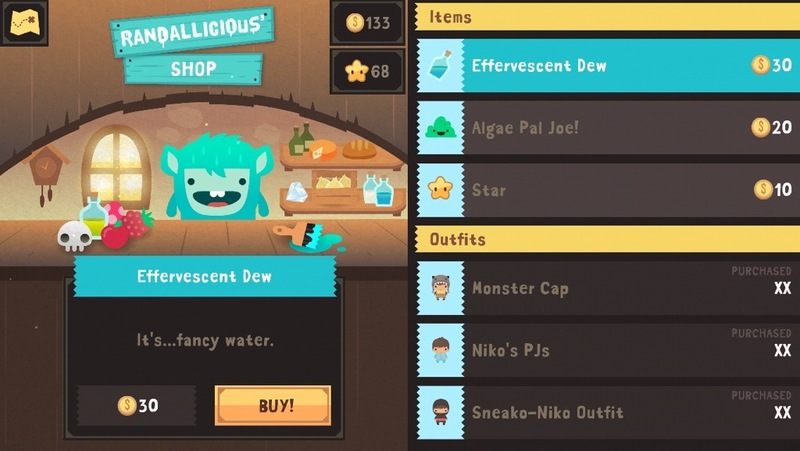 Try my Monsters Ate My Birthday Cake outfit/costume guide.